This is a genuine opportunity to bid for and potentially win a £50 note. 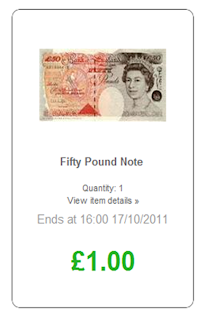 The starting price is just £1.00 and the increments are set at 1p, so lets see how good the winning deal is. This is no trick, but an honest incentive to get you to try out the Gotradelive system. It's only possible to offer this deal because Gotradelive is completely free and there is no transaction fee or set up fee to be paid to a third party. Its your tool to run as you want. To place a bid all you need to do is to register your name and email address - and choose a password. A free online B2B trading system for SMEs could help them cut costs and boost their revenue without having to make any investment. October 15. London. A new trading system for SMEs, Gotradelive, gives smaller businesses the trading power of bigger corporations, helping them compete more effectively and run a tighter more efficient sales operation. This cloud based platform (explained here) provides business networking as simple to use as Facebook and really useful buying and selling tools that will add a powerful string to any commercial bow. Gotradelive gives SMEs the capability to market their products and services more efficiently. Its features allow businesses to create an online trade for sale or tender and invite their own selected audience to place their bids. It’s very easy to use and maintains the privacy and control which is lost when using a public auction site. Founder and CEO Robert Doughty says it gives SMEs all the advantages of the trading portals and ebusiness systems that only multinational corporations can afford. “The odds are stacked against the SME and this platform will help them compete on a level playing field. It gives them better buying and selling power within their existing markets, and it helps them find and manage new market opportunities too.” says Doughty. Farmers, for example, are often forced to dump perfectly good stock. But using Gotradelive a farmer can quickly remarket and sell a consignment of vegetables that has unexpectedly been rejected by a supermarket, maybe just because they were ugly. Currently, finding a buyer at the last minute would have been too time consuming and the farmer would have had to bin them. But using Gotradelive the farmer can set up an online sale in under 5 minutes, contact all their alternative customers and invite them to bid for these bargains. The farmer salvages some money for his crop and the buyer gets a bargain they would have not even been aware of. Similarly, Gotradelive can be used for reverse trades or invitations to tender. The same farmer could invite a number of suppliers of fertilizer to tender for their next requirement, or maybe use it to find a new cost effective supplier of tractor tyres. In these cases Gotradelive brings a new liquidity to the SME sector and creates value by making new trading opportunities possible. 3. Large consumer audience based auction portals are expensive, and fees are disproportionate to trading margins. 5. The trader still makes the sale or purchase and puts the transaction through their own accounts under their own terms and conditions of business. 7. Trade only sellers are considerably more trust worthy and on Gotradelive the trader manages an audience they already know. 8. Gotradelive allows the trader to scale their business and still retain control. 10. Gotradelive adds a vital weapon in the commercial armory which enables the SME to operate effectively in the global trading community.